The Ecological Farmers of Ontario (EFAO) and local instructors Tim Aubin (Aubin Farms) and Ian Stutt (Patchwork Gardens) bring the” Essentials of Ecological Agriculture Course” to Kingston on November 8 and 9, 2013, for the first time since its inaugural teaching in 1984. The Essentials Course helps farmers share practical knowledge and learn about the foundations of ecological agriculture alongside their peers. “The Essentials Course is for all farmers who want to deepen their practical understanding of ecological agriculture,” says Rebecca Hodges, EFAO Training and Resources Coordinator. Topics covered include: soil biology and fertility, basic field crop rotation and weed control, livestock husbandry and manure management. As farmers continue to face regional challenges it is vitally important to build strength in local farming communities. The Essentials Course was designed to do just that. Click here for all course details and to register online. Please contact Rebecca Hodges (rebecca@efao.ca; 519.836.8606 ext.105) with questions. ABOUT THE EFAO: Ecological Farmers of Ontario was founded on the principle of sharing regionally appropriate skills and knowledge about ecological agriculture. “Almost 35 years later, EFAO remains committed to building strong, local networks of support for both new and experienced farmers,” says Shauna Bloom, EFAO Executive Director. In search of local answers Herb connected with Ayton, Ont.-based organic pioneer and apple grower Alvin Filsinger, among others, and they began meeting in 1979 as the Natural Farmers Association (NFA). The NFA focused on farm tours and educational events, and as a result the group grew to 50 members by 1982. 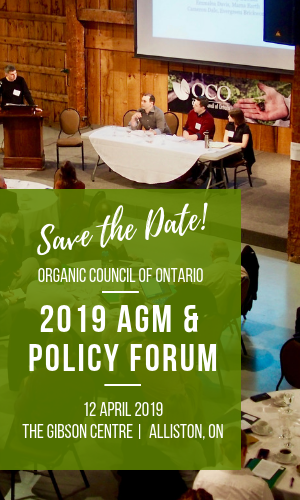 In 1984 the NFA officially became the Ecological Farmers Association of Ontario with Lawrence and Mathilde Andres (of Harmony Organic in Kincardine, Ont.) taking the reins. In its first official year, Michael Schmidt (Glencolton Farms, Durham, Ont.) and Bernhard Hack (Hack Farms,Kincardine, Ont. ), both experienced ecological farmers from Europe, planned a two-day course focused on soil building, animal health, crop rotations, composting and other basics. According to organizers, the weekend program was planned in less than a month with 100 people packed into the Arnow School House in Huron County. Since then, the Essentials Course has been adapted by experienced farmers and offered annually as a core course by EFAO. Today EFAO has almost 500 member farms spread across the province from Windsor in the West to Ottawa in the East and North to Sudbury. Providing accessible and relevant educational opportunities for farmers remains the motivating purpose for EFAO. Join EFAO, Ian Stutt and Tim Aubin as they put a fresh and local spin on the the Essentials Course being offered in East Region for the first time!